Daytime dreaming is usually a relaxing and healthy hobby. 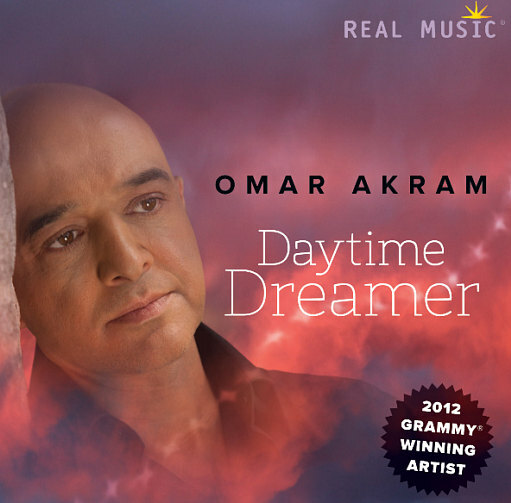 Daytime Dreamer is also the name of Omar Akram’s new album, released by Real Music. The follow-up to last year’s Grammy winning album is a masterful fusion of sound, proving once more that Omar Akram is THE name to follow in New Age music today. We are lucky to have him in our genre. Perhaps it is wrong to say new about an artist who has been active for over 10 years (and who will be pushing 50 in a few years), but at the moment New Age music is still heavily influenced by artists that debuted in the 1970s and 80s. That is OK of course, but we desperately need artists that can develop the genre further. One artist that is up for the job is the Afghan-American, New York based Omar Akram. Daytime Dreamer is his fifth album. At first listen it might seem like an album for contemplation and, yes, daytime dreaming. But hidden within each track are intertwining melodies and a remarkable international approach to New Age music. His use of instruments from the Middle East are a very welcome addition. Omar’s firm grip on harmonies, synth and piano arrangements are just as impressive. A good example of Akram’s style is the title track. The gentle, bright piano and synth, violin and Middle Eastern guitar, create a mix that is as refined as it is beautiful. My favorite track is the last one, called My Desire. The deep bass, the rhythm and the sharp piano make a dynamical trio, rounding up the album on a high note. Even the lush synth pad can’t take away the wonderful acoustic sound. Daytime Dreamer is without a doubt one of this year’s best album, and an impressive follow-up to Omar Akram’s Grammy winning album Echoes of Love. It is complete in every way.